In today's world of marketing, everywhere you go you are being marketed to in one form or another. Marketing is with you each second of your walking life. From morning to night you are exposed to thousands of marketing messages everyday. Marketing is something that affects you even though you may not necessarily be conscious of it. 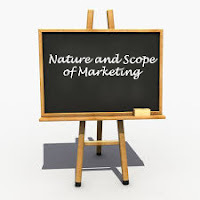 After reading this post you'll understand - What exactly the marketing is, to whom it is beneficial for, and what are the nature and scope of marketing. According to American Marketing Association (2004) - "Marketing is an organisational function and set of processes for creating, communicating and delivering value to customers and for managing relationships in a way that benefits both the organisation and the stakeholder." AMA (1960) - "Marketing is the performance of business activities that direct the flow of goods and services from producer to consumer or user." According to Eldridge (1970) - "Marketing is the combination of activities designed to produce profit through ascertaining, creating, stimulating, and satisfying the needs and/or wants of a selected segment of the market." According to Kotler (2000) - "A societal process by which individuals and groups obtain what they need and want through creating, offering, and freely exchanging products and services of value with others." Marketing embraces all the business activities involved in getting goods and services , from the hands of producers into the hands of final consumers. The business steps through which goods progress on their way to final consumers is the concern of marketing. In the process of marketing the ownership of goods transfers from seller to the purchaser or from producer to the end user. Marketing is that process through which a business enterprise, institution, or organisation interacts with the customers and stakeholders with the objective to earn profit, satisfy customers, and manage relationship. It is the performance of business activities that direct the flow of goods and services from producer to consumer or user. According to managerial or systems approach - "Marketing is the combination of activities designed to produce profit through ascertaining, creating, stimulating, and satisfying the needs and/or wants of a selected segment of the market." According to this approach the emphasis is on how the individual organisation processes marketing and develops the strategic dimensions of marketing activities. Efficient provision of distribution and payment processing systems. Goods are produced to satisfy consumer wants. Therefore study is done to identify consumer needs and wants. These needs and wants motivates consumer to purchase. Marketers performs study of consumer behaviour. Analysis of buyer behaviour helps marketer in market segmentation and targeting. Product planning and development starts with the generation of product idea and ends with the product development and commercialisation. Product planning includes everything from branding and packaging to product line expansion and contraction. Marketer has to determine pricing policies for their products. Pricing policies differs form product to product. It depends on the level of competition, product life cycle, marketing goals and objectives, etc. Study of distribution channel is important in marketing. For maximum sales and profit goods are required to be distributed to the maximum consumers at minimum cost. Promotion includes personal selling, sales promotion, and advertising. Right promotion mix is crucial in accomplishment of marketing goals. The product or service offered must satisfy consumer. Consumer satisfaction is the major objective of marketing. Great website, concise answers and understandable. Please come up with more subjects in a similar way. Kudos! Very easy to learn ,......... and very helpful lnformation... thank u! wow! what a nice piece, it was so helpful. All this notes greatly helped me for my exam preparation.... Thanks a lot! !